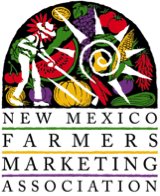 The New Mexico Farmers’ Marketing Association is excited to sponsor our 19th Annual Conference, which will be held March 10th and 11th in Santa Fe! The mandatory Double Up Food Bucks workshop will be held on March 9th. Register here by March 3rd! Break open your creative box and envision the possibilities for your farmer’s market, farm stand, farmers, and community! This year, conference attendees will have more opportunities for meaningful conversation with one another via enhanced breaks and open breakout sessions. This year we are asking you to register using our new online registration system! The new system will keep us up-to-date regarding our growing membership and keep you in-the-loop about our expanded trainings, workshops, and more through the coming season. HOTEL: A block of rooms has been reserved for conference attendees at La Quinta Inn (4298 Cerrillos Rd, Santa Fe). To reserve your room, please contact the hotel directly at 800-642-4239 and ask for the special rate for the New Mexico Farmers’ Marketing Association. Reservations should be made immediately. IMPORTANT NOTE: We reimburse for double-occupancy rooms to allow for two attendees per farmers’ market or farm stand. If only one person will be attending from your outlet, we will reimburse for 1/2 of a single-occupancy room; if you need a roommate, please contact Valerie Rangel and we will try to find a roommate for you. To get reimbursed, bring your hotel receipt (ask the hotel to give you two receipts so you have your own copy) to the conference on Saturday and Sarah Grant will write you a check for reimbursement. Before giving the receipt to Sarah, please write on the receipt the name of your market and the names of the people who occupied the room. You can also mail in your receipt to Sarah; she will reimburse you as long as she receives the receipt by March 24th. This workshop is mandatory for all participating (and prospective) Double Up Food Bucks farmers’ markets and farm stands (contact Sarah Lucero with questions about the Double Up workshop). Registration: 1PM to 2PM. Please give yourself enough time to both register and pick up your Double Up packets. Year-in-Review: This overview of the 2016 season and preview of the 2017 Double Up season will provide the New Mexico DUFB community with important facts and information including research findings, sales summaries, policy outlook, new partnerships, outreach, and more! Breakout Sessions: This season we’re excited to offer TWO TRACKS for the Double Up Workshop: One for new or prospective Double Up managers, and the second for experienced managers. Your Voice: Share your experiences and learn from others for a successful 2017! Dinner is pay-on-your-own, but if you would like to join the group at a local restaurant, you will need to let us know when you register. Registration 8AM: If you’ve already registered on Thursday, you do not need to re-register. State of the Plate: Our Executive Director Denise Miller will present a review of 2016 and a preview of the great things to come in 2017. Keynote Speaker: We’re pleased to have Moises Gonzales — Assistant Professor of UNM’s Community Regional Planning Program — speak to us about strengthening local food systems. Roundtable Discussions: Share! Learn! Grow! Thought-provoking table discussions with your colleagues will be moderated by Moises Gonzales. Lunch: Local fare will be provided! Multiple Breakout Sessions and with three tracks: Choose what interests you! Sessions will be provided for farmers and farm stands, new market managers, and advanced market managers! Dinner and Social! Join us and mingle with your colleagues as we host an evening dinner and social from 5PM to 7:30PM. Visit the Santa Fe Farmers’ Market: Head over to one of the oldest farmers’ markets in the US for a field trip! Women, Infants, and Children: Martin Miller with the New Mexico Department of Health will answer your questions about WIC and your market. Membership Never Looked So Good: Learn about the NMFMA’s exciting new membership website and hear about plans for bringing farmers into the NMFMA’s membership. Lunch: Local fare will again be provided! Your Voice: Learn about what your colleagues have to say! 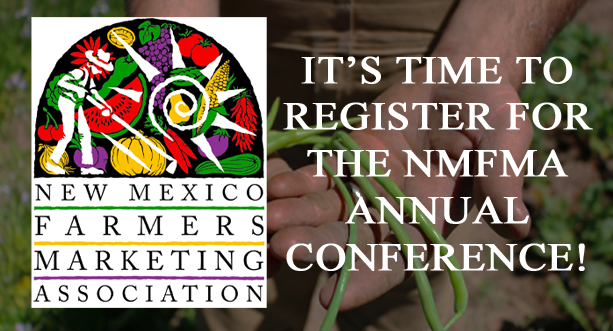 Register here for the NMFMA Annual Conference today! Registration ends March 3rd!